This guide is written by Monkioh, a main raider in Midwinter. He also maintains the Mistweaver Monk guide on the MMO-Champion forums. Monkioh has been raiding on his Monk since Throne of Thunder during the Mists of Pandaria expansion, and started playing the game in 2005. Mistweaver is a relatively new spec, introduced with the Mists of Pandaria expansion, but it has quickly found its place in a raiding environment. Mistweavers primarily act as raid healers who focus on healing many targets at the same time, rather than focusing on healing single targets or tanks. That’s not to say that Mistweavers can’t do single target healing though. Their burst single target healing is very strong, but it tends to be very inefficient. Relative to other healing specs, Mistweavers are quite good. Their area of effect (AoE) and single target burst are both extremely good. Mistweavers also tend to have less mana problems than specs like Resto Druid or Shaman. For utility, Mistweavers have a fairly unique ability to contribute significant damage while also doing passive healing. This is called Fistweaving and the healing is caused by an effect called Eminence, which converts a percentage of your damage into healing. Monks have a dual resource system which uses Mana as a primary resource and Chi as a secondary resource. Some abilities cost mana, while others cost Chi. Managing these resources is a key factor in determining your success as a Mistweaver. Monks are also the only healer that still has a baseline mana regen tool. For Monks, Mana Tea exists to offset the relatively high cost of their spells. For every 4 Chi that you spend, you gain one stack of Mana Tea with a chance, equal to your Critical Strike chance to gain an extra stack. As with Mana and Chi, Mana Tea is also a resources you have to manage properly. Mistweavers are considered by many to be the most complex of the healer specs, but they are an excellent addition to any raid healing composition if played well. If anything in this guide doesn’t make sense, or you think it was poorly explained, or you simply have questions, then please leave a comment below. Use your single target healing in small groups or to prevent individuals from dying in raids. • For single target healing, be in Stance of the Wise Serpent. Most of your healing abilities are only available in this stance and it will increase your healing done by 20%. 1) Cast Summon Jade Serpent Statue and place it nearby. This statue will cast Soothing Mist whenever you do, so always have this placed somewhere when you are healing. 2) Cast Soothing Mist often if the tank or another player is taking light to moderate damage. 3) Cast Surging Mist to generate Chi and spend that Chi on Enveloping Mist if the target is taking moderate to high damage. 4) Cast Life Cocoon as a tank cooldown or to save a player from dangerous boss mechanics. 5) If you have taken Zen Sphere or Chi Wave, then cast those on cooldown for some free healing. 6) Cast Thunder Focus Tea and use the buff on Surging Mist if you need more burst healing. Thunder Focus Tea causes your next Renewing Mist to jump to 5 total targets, instead of 3, OR increases the healing of your next Surging Mist by 100%. You can only gain one of those effects per cast of TFT, so for single target healing, you want to consume the buff with Surging Mist. • If you have taken Chi Explosion, then it replaces Enveloping Mist for single target healing. You should also only cast it with 4 Chi. Use your AoE healing in raids when 6 or more people have taken damage. • For AoE healing, be in Stance of the Wise Serpent. Most of your healing abilities are only available in this stance and it will increase your healing done by 20%. 1) Cast Renewing Mist before the raid takes damage. You want to have at least 6 Renewing Mists before you cast Uplift. Renewing Mist generates 1 Chi and will jump to a maximum of 3 targets per cast. 2) Cast Uplift when you have 6 or more Renewing Mists on the raid. Uplift costs 2 Chi and will heal each person with a Renewing Mist on them. 3) Cast Spinning Crane Kick when you need more throughput than just Renewing Mist and Uplift. This can drain your mana quickly, so only use it for periods of high damage. 4) Cast Revival if the raid has taken heavy damage or at a specified time if your raid has organized the healer raid cooldowns. 5) Cast Thunder Focus Tea and use the buff on Renewing Mist if you need more spread healing. Thunder Focus Tea causes your next Renewing Mist to jump to 5 total targets, instead of 3, OR increases the healing of your next Surging Mist by 100%. You can only gain one of those effects per cast of TFT, so for AoE healing, you want to consume the buff with Renewing Mist. • If you have taken Chi Explosion, then it replaces Uplift for stacked AoE healing. Try to use it on stacked targets, such as the melee group. If there are no stacked groups, then you should continue to use Uplift as your AoE Chi-spender. You should also only cast Chi Explosion with 4 Chi. Fistweaving is the practice of dealing damage while in Stance of the Spirited Crane. • For Fistweaving, be in Stance of the Spirited Crane. Most of your damage dealing abilities are only available in this stance and it will grant you and your Jade Serpent Statue the passive ability, Eminence. • Place your Jade Serpent Statue within 20 yards of players who will need healing. Since Eminence applies to both you and the statue, you can choose where the other half of your healing goes by placing your statue in a good spot. For example, if you expect both the melee and ranged to take damage while you are Fistweaving, then place your statue near the ranged. This way 50% of your damage heals the melee and the other 50% heals the ranged. • Vital Mists is an important part of Fistweaving. For each 1 Chi you spend, you get 1 stack of Vital Mists. Each stack of Vital Mists reduces the cast time and mana cost of your next Surging Mist by 20%. This effect can stack up to 5 times. The goal is to spend Chi until you reach a 5 stack of Vital Mists, then cast an instant, free Surging Mist. This will generate 1 Chi and give you a little bit more healing. With the 2pc Tier 17 bonus, consuming a 5 stack of Vital Mists generates an extra 1 Chi, so you will want to make sure you only cast Surging when you have 5 stacks. 1) Cast Jab or Expel Harm to generate Chi. 2) Cast Rising Sun Kick on cooldown. The Pool of Mists talent gives your Rising Sun Kick 50% increased damage and 3 charges. You should try to spend all of these charges as quickly as possible, especially if you need to burst a target. 3) Cast Blackout Kick only when you need to refresh your Crane’s Zeal buff or if you have no more charges left on RSK. Crane’s Zeal is a buff that gives you 20% extra Critical Strike, so you want to keep this up as much as possible without letting your RSK charges cap out. 4) Cast Tiger Palm only when you need to refresh your Tiger Power buff. Tiger Power lets your attacks ignore 30% of your targets armor. This increases the damage of your RSK, so you will want to keep this up as much as possible. 5) Cast Crackling Jade Lightning only if you have the mana to spare and you need a quick 4 Chi. Good times to use this are if you have a lot of mana and Mana Tea stacks and you have 2 or more charges available on your RSK. Cast CJL, get 4 Chi, and spend it on RSK to avoid capping your charges. • If you have taken Chi Explosion, then your Fistweaving rotation becomes very simple. Note that Chi Explosion will not do nearly as much damage as Pool of Mists, but it could do more healing if a fight has consistent, heavy aoe damage. 1) Cast Jab or Expel Harm to 4 Chi. 2) Cast Chi Explosion with 4 Chi. Yep, that’s it. You only want to cast Chi Explosion with 4 Chi. 3) If you want, you can choose to keep up your Crane’s Zeal buff and the RSK debuff, which causes your targets to take 20% more damage, but it’s not worth it if your goal is to do as much healing as possible with Chi Explosion. If you wanted to do more damage though, you should just use Pool of Mists. You can do more than just heal, and here’s how. 1) Fortifying Brew is your minor defensive cooldown. It’s also the only one you have as a baseline. It will reduce your damage taken by 20% and increase your health by 20% for 15 seconds. 2) Dampen Harm/Diffuse Magic. 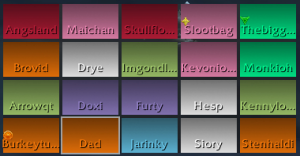 These are talents in your level 75 talent row and are much better cooldowns than Fort Brew. You can only have one of them, but they both have their uses. Dampen Harm is really good for repeated attacks, while Diffuse Magic is better for single, large damage magic attacks. Pick the one that makes the most sense for the boss you’re on. 4) Expel Harm. I put Expel Harm in here because it’s a decent self heal, but it also acts as your cheapest Chi generator, so use it often. 4) Nimble Brew will get you out of root, stun, fear, and horrify effects when you use it. You can’t always use this for raid mechanics, but you should always try. 1) Touch of Death is an amazing ability that deals damage to your target equal to your maximum health. It costs 3 Chi, but can only be used if your target has less current health than your maximum health, or if the target is below 10% of their maximum health. This can be very potent if used on priority targets such as Primal Elementalists on Blast Furnace, Cinder Wolves on Flamebender, or the pillars on Kromog. If you can, you want to try to use Touch of Death while you’re in Stance of the Spirited Crane because that damage gets converted into healing. So swap to Crane, cast Touch of Death, and it heals 2 targets for 50% of your max health. It’s like a split Lay on Hands! 3) Provoke is your taunt. Yes, your taunt. I wouldn’t recommend using this too often, but it’s one common use is to cast Provoke on a boss, then swap locations with the Transcendence spirit that you would have placed outside the boss’ room before pulling. This is very useful for progression as it can save thousands of gold in repair and rune costs as well time that would have otherwise been spent running back. 4) Leg Sweep is one of the best stuns in the game. It’s an AoE, 5-second stun. There are opportunities to stun mobs, even in raids, so you should be looking to use this whenever possible. 5) Spear Hand Strike is your interrupt ability. Not every healer has an interrupt, and even fewer can always be safely in range to use theirs. Monks have a unique advantage in that most mechanics that prefer ranged targets do not target Monks. This allows Monks, as healers, to safely be in melee range, which allows them to utilize their interrupt far more often then, say, a Paladin. Don’t ignore this. When there’s something that needs to be interrupted in raids, it’s usually one of the most important mechanics to handle, so be useful and interrupt! 6) Paralysis. This is a minor point as you don’t get much chance to use crowd control abilities in raids anymore, but it’s good to have it available just in case and it’s especially good in 5-man content if someone accidentally pulls an extra mob or you need more CC. Level 15: Go with either Tiger’s Lust or Celerity. Tiger’s Lust is a great sprint/freedom for extended periods of movement, but Celerity is better for burst movement. Celerity is mandatory if you take Chi Torpedo further down in the talent tree. Level 30: Default to Chi Burst for raid healing, but use Zen Sphere or Chi Wave for single target or small group play (5-mans). If you plan the spend most, if not all, of your time in Stance of the Spirited Crane and it’s a single target fight, you should use Zen Sphere or Chi Wave. Chi Burst will be better for burst aoe damage. Level 45: Take Chi Brew or Power Strikes. This is all about personal preference. Chi Brew offers you more control over when you get the Chi and gives Mana Tea stacks, but Power Strikes will net you more Chi consistently. The increased Spirit provided by Ascension is simply not good enough to take over the other two talents. Level 60: Leg Sweep is your best option here if you choose to be in melee. If you cannot be in melee, but still need to stun, then you can take Charging Ox Wave. Level 75: Go with Dampen Harm or Diffuse Magic here. Use Dampen Harm if the fight has high damage mechanics that will hit you multiple times such as Gruul’s Inferno Slice. Use Diffuse Magic if the fight has a magical mechanic that you want to essentially “immune” such as Kromog’s Stone Breath. Level 90: Rushing Jade Wind will give you the most healing, but it also has a high mana cost. Default to this if you are able to manage your mana properly. Chi Torpedo is an excellent, mana-friendly alternative, but be sure to take Celerity with it. Xuen should only be taken for 5-man content or if you plan to Fistweave for an entire boss fight. Level 100: Default to Pool of Mists for raid healing. Chi Explosion can do decent healing, but it does not offer the flexibility and dps utility that Pool of Mists does. Breath of the Serpent is strong, but has too many positional and stacking requirements to be practical. Increases the range of your Renewing Mist’s jump by 20 yards, allowing it to jump 40 yards. This glyph is mandatory for raid healing. Gives you a 60% movement speed increase for a duration based on how long you spent channeling Soothing Mist. Good for fights with a lot of movement and any amount of single target healing. Removes the target requirement for Surging Mist while you are in Stance of the Spirited Crane. Casting it will heal an injured target within 40 yards. Good glyph if you do any amount of Fistweaving as it’s one less thing you have to manage. Note that Surging Mist’s functionality is not affected by this glyph while in Stance of the Wise Serpent. This allows you to cast Expel Harm on other friendly targets. The healing on other targets is reduced by 50% though. Keep in mind that if you use Expel Harm on yourself with this glyph, the healing is not reduced. All minor glyphs are purely cosmetic for Mistweavers, so use whatever you want. Removes the Chi cost from Touch of Death, but increases the cooldown by 2 minutes. You can use this glyph on encounters where you only expect to cast it once or only every 3.5 minutes. A good example is a purely single target fight like Gruul. Gives your Detox (dispel) 2 charges, but increases its cooldown by 4 seconds. This glyph is useful if the boss fight has some mechanic that you have to dispel from multiple people such as Beastlord Darmac’s Conflagration ability. Do not use this glyph. This removes the channel from Mana Tea and allows you to instantly consume 2 stacks, but adds a 10 second cooldown. Mana Tea now channels at a rate of 2 per second, so this glyph is nearly pointless unless you cannot find any time to channel Mana Tea throughout a fight. Spirit is extremely valuable as it allows you to regenerate a significant amount of mana passively over time, but also because of the way Mana Tea works. Mana Tea restores mana equal to 3 times your unbuffed Spirit. Temporary spirit increases, such as those from trinket procs, do not count towards Mana Tea’s mana restoration. The more passive Spirit you have, the more mana each stack of Mana Tea will return. Intellect is a primary stat that provides 1 Spell Power (SP) per point. All of your spells use Intellect to determine their potency. Multistrike gives your spells two chances to deal damage or healing for 30% of the original amount. Multistrike is Mistweaver’s attunement stat via the passive ability, Jade Mists. It gives Mistweavers 5% more Multistrike from all sources and gives your Renewing Mist and Rising Sun Kick a chance, equal to your Multistrike chance, to not go on cooldown when used. You cannot get back to back procs. Versatility increases all damage and healing done, and decreases all damage taken. This is just a solid stat overall. Critical Strike gives your spells and abilities a chance to deal double damage or healing. Critical Strike also gives you a chance, equal to your Critical Strike chance, to gain an extra stack of Mana Tea whenever you generate one. Haste increases your attack and spell casting speed as well as reduces the global cooldown (GCD) on all your abilities. Haste also gives your HoTs extra, partial ticks. Haste is generally considered a poor stat for Mistweaver healing, but a decent stat for Fistweaving. Mastery Mastery: Gift of the Serpent, gives your healing spells a chance to spawn a Healing Sphere that will heal an injured target who moves through it or detonate after 30 seconds, healing a nearby target. Mastery rating scales very poorly for Mistweaver Monks. The 2pc Tier 17 bonus causes your Soothing Mist to increase your Multistrike chance by 5% each time it heals. The increased Multistrike only lasts as long as you’re channeling Soothing Mist. Instant spells cast during your Soothing channel do benefit from the increased Multistrike. The 2pc also gives you 1 Chi when you consume a 5 stack of Vital Mists. This, in effect, gives you 2 Chi every time you consume that 5 stack. 1 Chi from the Surging Mist, and 1 from the 2pc. This is extremely useful for smoothing out the Crane rotation. The 4pc Tier 17 bonus says that your Surging Mist Multistrikes give you a stacking buff, up to 2 stacks, which cause your next Thunder Focus Tea to generate 1 Chi for each stack. Keep in mind that each cast of Surging Mist has 2 chances to Multistrike, so you can get 2 stacks of the 4pc bonus from 1 Surging Mist cast. If you plan to Fistweave at the start of a boss fight, you should spam Surging Mist in Crane stance before you pull to stack this bonus up for some reserve Chi. It’s like having another charge of Chi Brew. *Alternative trinket if you cannot get Blackiron Micro Crucible. **Not BiS at the moment, but hold onto it if you get one. Blizzard may buff Spirit in the near future. Most of your healing will be done to the ranged group. They will take damage from Acid Torrent and any casts of Blackrock Barrage that are not interrupted. The melee will also take damage from Explosive Shard, so try to keep a few Renewing Mists on them if you can. You mostly want to make sure you have as many Renewing Mists as possible on the ranged and focus on casting Uplifts for the large Acid Torrent hits. Use Rushing Jade Wind on really big hits, but don’t spam it as it can drain your mana very quickly. You can also use Life Cocoon on the tank soaking Acid Torrent to severely reduce the damage it does. For the Rolling Fury phase, keep trying to spread Renewing Mist and cast as many Uplifts as possible as it ignores line of sight. This is also the best time to use Revival since it has a 100 yard range, allowing it to hit everyone in the room. Transcendence is also really good for this phase if he is going to roll into you, but you cannot run away in time. Finally, try to use Touch of Death on one of the ore crates to get them down as quickly as possible. You can actually Fistweave for a very long time at the start of the fight. You should swap to Stance of the Wise Serpent once Shattered Vertebrae and Aftershock damage starts ramping up though. RJW is great for this fight because you can cast it while moving and the damage is spread out enough that your mana should be able to handle it regardless of gear level. Be sure to use Life Cocoon on one of the tanks when they get Crippling Suplex. Most of the damage during this fight is very predictable and low. You can Fistweave most of the fight until near the end when Tantrum damage is really high. You will want to have cooldowns organized for the Tantrums as they are the most dangerous parts of the fight. Take Glyph of Detoxing for dispelling the Conflagration and try to stay in melee to avoid the risk of being hit by Pin Down. Dampen Harm is excellent for reducing the damage of Inferno Slice, especially when your group takes 2 hits. Just try to throw Renewing Mist on targets who are about to get hit by Inferno Slice and time your Uplift casts with Gruul’s casts. You can use RJW or Chi Torpedo to supplement your healing on your group. Use Life Cocoon on the tank soaking Inferno Slice to reduce his damage taken significantly. You can also Fistweave for a good portion of the fight, but be careful of Overwhelming Blows. Stand at max melee range. You have a lot of talent choices here, but it really depends on how you handle this fight. I tend to Fistweave the entire fight except for when she casts Firestorm. Take Chi Burst, Power Strikes and RJW if you spend more time healing than Fistweaving, but take Zen Sphere, Chi Brew, and RJW/Xuen if you want to Fistweave for everything but Firestorm. Make sure you have Renewing Mists already rolling right before Firestorm starts, then spam Uplifts and RJW/SCK. You shouldn’t need much mana outside of Firestorms, so don’t hold back. Finally, don’t forget to use Touch of Death on Aknor or any of the Cinder Wolves throughout the fight. The biggest dangers of this fight are the Iron Bellows casts by the Grom’kar Man-at-Arms and the stacks of Burning caused by both the Deforesters and the rings of fire patches on the ground. You will want to spend your mana in bursts for these mechanics and Fistweave in between them. Half your raid is most likely stacked when people have Burning from the Deforesters, so this is a good time for RJW and Chi Burst. Transcendence is amazing for this fight as it allows you to bypass most of the Deforester attacks, but you have to place it ahead of time, so plan your movement. Be sure to use Touch of Death on high priority adds like the Man-at-Arms. This fight has a lot of raid damage in phase 2 and especially in phase 3, so you will want to preserve as much of your mana and Mana Tea stacks as possible for those phases. If you’re not confident in your mana, you can take Chi Torpedo instead of RJW and do just fine. I tend to Fistweave for the first two Bellows Operators, then swap to Serpent and play as efficiently as possible until midway through phase 2. At this point, the damage is probably getting high, so you will want to consider using RJW or CT, but only if the raid is really low because you still need a lot of mana for phase 3. If you think the damage taken is manageable by the other healers, you can Fistweave and Touch of Death the Primal Elementalists to help speed up the fight. Once you’ve hit phase 3, just blow through as much mana and Mana Tea stacks as needed to get through it. There’s no reason to end this fight with mana left in your tank. Spam as many Renewing Mists, Uplifts, and RJWs as you can and channel Mana Tea during the breaks between Blast casts. This is a very high damage fight and can be quite hard on your mana. Try to use RJW here as its burst healing is really good, but if your mana cannot handle it, then swap to Chi Torpedo. Pool your Chi for Stone Breath casts and spam during them to keep the raid’s health stable. This is where people have the highest chance of dying, so do what you have to. You can use Touch of Death on the pillars in Mythic difficulty to help the raid get them down in time. Until the last phase, I recommend just Fistweaving. If you get sent to do one of the boats, then swap to Serpent until its done, then go back to Fistweaving. Once you’ve gotten to the last phase, swap to Serpent and do your best to keep the raid’s health stable. Focus on overall raid health and let the other healers triage the single targets for the most part. Use Dampen Harm and Fortifying Brew if you need to soak the Penetrating Shot. Spend as much mana as you need to in phase 1 because you will have time to regen it all in phase 2. For phase 1, spread Renewing Mists a few seconds before he begins dropping Demolition, then keep RJW up and spam as many Uplifts as possible to get through it. You should be able to use one Chi Burst per Demolition set too. Use Revival after the second Demolition that lands (in a set) to ensure that the raid doesn’t die to the next two. For phase 2, you will want to play as efficiently as possible. Your goal is to leave this phase with 90-100% mana and 20 stacks of Mana Tea. You can do this by not using RJW at all and focusing mainly on Soothing Mist, Renewing Mist, and Uplift. You should also go up to the balconies to use Touch of Death on the adds whenever the cooldown is up. The biggest danger here is getting hit by Impaling Throw. Phase 3 is the hardest, yet simplest for you to heal. Once the damage starts ramping up, you will want to keep RJW up all the time, just hit it on cooldown. In between RJW casts and Mana Tea channeling, you should keep casting as many Chi Bursts, Renewing Mists, and Uplifts as possible. Don’t hold back at all in this phase, the damage is very high. You can use Transcendence here if you get knocked back by an Impaling Throw and combine it with Dampen Harm to essentially negate the mechanic. Finally, be sure to use Life Cocoon on the tank soaking the Massive Shattering Smash. Grid2 is one of the many raid frame addons that are available. You could also use Grid or Vuhdo. I prefer Grid2 because it allows for a lot of customization. You can change how health bars are aligned, how groups are set up, where and which buffs and debuffs are displayed, and much more. It requires a bit of work, but it’s worth it in the end to have a UI element tailored for you, by you. WeakAuras is an absolutely amazing addon and the only one that I would say is almost mandatory for raiding at a high level. 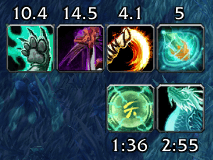 You can use WeakAuras to track pretty much anything such as buffs, debuffs, boss abilities, you name it. The best part is that any custom Auras that you make can be shared, so if you see something that you like, you can just ask for the WeakAura string to import it! If you have no other addons for raiding, at least get this one. It’s worth it. This is the base macro that I use to create all of my mouseover macros. If you have your mouse over a friendly target, it will cast the SPELL on that target. If you don’t have a mouseover target, but have a friendly player targeted, then it will cast the SPELL on them. If you have no target or mouseover target, then it will cast the SPELL on yourself. Simply replace SPELL with whatever spell you want to cast. This allows you to use the same button for Dampen Harm and Diffuse Magic without having to move the ability from the talents pane to your action bar.